Some of the media seem to be in a state of panic this week with the news that the number of foreign-born people living in Britain has reached 8 million, and net migration to the UK has reached record levels. Not all those born abroad can be described as ‘foreigners’, contrary to the alarmist reports splashed in newspapers such as The Express, The Telegraph and the Daily Mail. For example, London Mayor and Conservative MP, Boris Johnson, was born in the USA. Ashes winning cricketer, Ben Stokes, was born in New Zealand. Actress Emma Watson was born in France. Mo Farrah, Olympic gold medallist for Britain, was born in Somalia. Actress Joanna Lumley was born in India. And the Queen’s husband, the Duke of Edinburgh, was born in Greece… to mention just a few. In any case, why does it matter? Where we live is surely more important than where we’ve come from. We have all arrived from a long ancestral journey that spanned the planet for tens of thousands of years. We are, actually, all descended from migrants. But it’s not only the record number of foreign-born residents in Britain that has been targeted as ‘bad news’ by much of the media and many politicians this week. The word ‘migration’ now seems to have become toxic. So also presented as ‘bad news’ this week was the report that net migration to the country reached a new record high in the year to March 2014, with 330,000 more migrants coming to the UK than left. 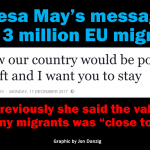 This was reported as presenting a big headache for UK Prime Minister, David Cameron, because he had promised to bring down ‘net migration’ to tens of thousands from the current level of hundreds of thousands. But why is migration here considered such a terrible thing? Instead, the record numbers of people wanting to come to Britain could be celebrated as a huge success story. The fact is that most migrants come to Britain to work or study – and that’s primarily what they do. Most migrants who come to work in Britain are in gainful employment, making significant net contributions to our treasury and helping the British economy to thrive. 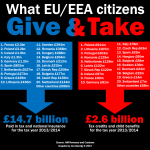 And those migrants coming here to study are contributing billions to the running costs of our colleges and universities – foreign revenue which those educational establishments very much need, and which the wider community also benefits from through extra spending by foreign students. The reason so many migrants are currently coming here to work is because the British economy is doing so well compared to other European countries – resulting in many new vacancies being created which cannot simply be filled by those unfortunate to be registered as unemployed. Benefit tourism? Where’s the evidence for that? The proportion of migrants claiming benefits is considerably lower than for British citizens. Three times the European Commission asked the British government for evidence of so-called ‘benefit tourism’ by EU migrants coming to work in the UK. Three times the British government failed to provide any. And migration is not a one-way trip. Many British people also migrate to other countries mostly for the exact same reason that migrants mostly come here: to work. Britain is the biggest exporter of people to the rest of Europe, and the world’s third biggest exporter of people across the planet. Isn’t it a bit odd that people in Britain should consider migration here to be such a bad thing, when British people make fuller use of ‘free movement of people’ across Europe than any other EU nationality? And another thing: many migrants quoted as coming to Britain were actually British people returning home from living abroad. How many newspapers reported that? The British government has pledged to reduce net migration to less than 100,000. Why? I cannot find any economic reasons for such a policy. And in the absence of an economic reason, what other reason could there be to want to reduce migration to the country? Could it simply be that the government has been responding to an irrational fear and dislike of foreigners? Has anyone actually considered that reducing net migration to Britain to less than 100,000 might make the country – and all of us – poorer? Do we really want to deter workers and students coming to the UK who are making such a significant contribution to our economy? Rather than continually trying and failing to stem the flow of natural and legal migration here in pursuit of jobs and studies, wouldn’t it be more cost effective for the government to invest considerably more in our infrastructure, such as homes, schools and hospitals? In that way, the residents of Great Britain – of whatever nationality – could be properly accommodated, allowing them to get on with what most of us want to do: work or study. This entry was posted in Current Affairs, Democracy & Citizenship, Economics & Trade, Education, Global & International, Law & Justice, Media & Communications, Society & Culture, The EU and tagged Ben Stokes, Boris Johnson, Duke of Edinburgh, Emma Watson, European Union, foreign-born, immigration, Joanna Lumley, migration, Mo Farrah. Bookmark the permalink. 10 Responses to Why is Britain so against migration? You are avoiding the obvious, I hope not by design. If you can’t see it you must be divorced from the real world with your cushy media job and PC brainwashing. While I feel for the refugees suffering the ridiculous war in Syria I can’t see why the UK should be accommodating them, and one drowned child among thousands of dead children in the Middle East crisis should not be having the effect it is having on the British public. The UK is a small country and has a massive housing crisis. Rents are astronomically high compared to most of Europe, and they aren’t going to come down anytime soon. I don’t own a home and I never will because I can’t afford it and can’t get a mortgage on my wage. We should be reducing our population, not increasing it. The roads are clogged up with traffic. Trains are standing room only. Everything is too expensive because there is such a massive demand for product/services. If you apply for a job there are countless others going for the same position. This migration to Europe is just economic opportunism. Why do you think Sweden, Germany and the UK so desirable to the refugees? If it wasn’t for economic reasons they would be going to Saudi Arabia (easily rich enough to deal with them), Turkey etc where they would be culturally comfortable. You can blame the UK for its colonial past, and contributing to the crisis in the Middle East by being belligerent and I would agree with you,(and that is due partly to a failure of the Arab League and the UN) but what about Sweden who didn’t have an empire and don’t get involved in wars? Why are there so many Muslims in Sweden where they are showing exactly why they should have settled in Saudi or Turkey. If I was a migrating Christian I would migrate to a Christian country so I could do my Cristian behaviour in peace with other Christians. I would not migrate to Morocco or Algeria. Thank you Jim for your posting; I have added paragraph spaces to your commentary so that it’s easier to read. There is a huge difference between ‘economic migrants’ and ‘refugees’. The two are not the same. The vast majority of people trying to escape across the Mediterranean are refugees, genuinely fleeing from war, terror, genocide, enslavement, torture and murder. If you have proof otherwise, please let me know. You have given a hint to the goals of refugees after they have reached safety – of course their first goal. Their next goal is to work out where would be the best place to start again, especially as it may never be possible to return to their home countries, or maybe not for many years. You have indicated that if you were a refugee, you wouldn’t necessarily want to settle in the first safe county you reached, you’d want to do your best to reach a country where you felt the culture, language, etc, was compatible. For exactly the same reasons, given a choice (and believe me, the vast majority of the current 60 million displaced persons in the world have absolutely no choice), refugees try to reach a country where they feel some connection – such as language, family, friends, or maybe as in the case of the Calais refugees, a past colonial connection. Please don’t mix up migrants with refugees. Asylum seekers in the UK are not entitled to normal benefits, they will get basic accommodation, but only about £36 a week subsistence allowance, and most will be forbidden from working. Most asylum seekers in the UK – and by comparison to many other countries in Europe, there are not many here – most of them are poverty stricken. Syrian refugees have an extremely tough time in Turkey and Saudi Arabia is not accepting refugees from Syria. So, this is a rather complicated problem. Can I please ask you to try and make the time to read my latest article today, which may provide you with new information as to why refugees are sometimes desperate to escape from the first so-called ‘safe’ country they reach – and why so many refugees subsequently will be prepared to risk life and limb to get to somewhere where they feel they might be able to start again. I do think that, unless you have ever been a refugee, or been close to the life of a refugee, it’s very difficult for most people to understand what’s involved in trying to escape obscene terror and then, with a mind intact, to make the right decisions for you and your family to start life again somewhere. Especially when it seems that the entire world really doesn’t want to know, and would prefer that you simply went somewhere else. Of course I know the difference between economic migrants and refugees, but these refugees are behaving like economic migrants, otherwise they wouldn’t be travelling so far. You have totally failed to address the main points of my comment. There are simply too many people in the UK’s cities; the housing crisis; the NHS crisis; the education/childcare crisis; the transport crisis; the jobs crisis. All these are as a result of too many people in the country and too little money spent on infrastructure & social care by the government. It is as if your brain blocks these issues because they don’t fit in with your desire to continue to cram more people into the country in an altruistic fervour. So Saudi Arabia is not accepting refugees from Syria. Why not? Don’t they have a conscience? Have they no humanity? Have they not seen the photograph of the little boy washed up on the beach? Thank you for your response, I have actually answered your points in this and other articles I have written and don’t always have the time to repeat them over and over again in the comments section. If you are genuinely interested in my point of view on this, please feel free to look around the many articles on my various blogs. I don’t agree with you about refugees acting as if they were economic migrants. Most of the many millions of migrants are accommodated by poor countries and don’t have the chance to go any further. Lebanon, for example, has around 1.2 million refugees in a country with a population of only 4.5 million. Clearly, Lebanon really is overwhelmed, we are not. Refugees not only need to find a country of safety, but somewhere they feel they can start their lives again. Sometimes safe countries are not that safe at all: the 2.5 million Syrian refugees in Turkey don’t feel welcome there at all, and many of them have been forced to live on the streets according to recent news reports. Many refugees spend years in stasis in overcrowded, dirty camps, with little food or water, no home life, and no prospects for ‘moving on’. It might be relatively ‘safe’ but it’s hardly a basis for starting one’s life again. Of course our government is right in saying that the underlying cause of what is now the world’s worst refugee crisis on record should be tackled. But what is being proposed? We bombed some of the countries now in crisis back to the Stone Age and then left, with governments simply incapable to properly defend themselves. For the refugees to start returning to their home countries, a war would have to be won against ISIS and other terrorist groups. Who will help those countries to do that? The bombs we are dropping on Iraq, and which Britain soon hopes we will also be dropping onto Syria, might occasionally strike lucky and kill some terrorists, but they are also helping to turn yet more innocent citizens into refugees. Regarding migrants legally entitled to come to this country, that’s an entirely separate subject to the global crisis of 60 million displaced persons. I don’t blame migrants for the pressure on our schools, hospitals, etc. I blame successive governments for not investing sufficiently in our infrastructure. Migrants are profitable to this country. They overall make a net contribution to our Treasury. We actually have a bargain in migrants: they come here ready-educated and ready-trained in many skills, training that was paid by another country. We need migrants because we have more job vacancies than enough sufficiently skilled or willing British people to fill them all. Fewer vacancies would result in fewer migrants. So one way to reduce the number of migrants coming here is to trash our economy. (Not a good idea). If all the migrants left, and all the British who migrated abroad returned, we’d still need more investment in our infrastructure. Or if just the migrants left and Britons and new migrants didn’t replace them, how would we have enough doctors and nurses, for example, to work in our hospitals? I am, incidentally, not in favour of migration to Great Britain because I think it’s good for migrants. I am in favour of migration because I believe its good for Britain. Well, why would anyone fleeing a dictatorship go to an even harsher dictatorship? The point of asylum law is to offer protection from persecution. It should be obvious that Saudi Arabia doesn’t even offer this protection to its own citizens. This is based on a complete misunderstanding of human beings and Muslims in general. Religion is not that important to most people, regardless of their nominal belief. It’s not how they/we identify themselves/ourselves. And actually, most Syrians are culturally much closer to Europeans than to Saudis. This argument is as absurd as telling a Guatemalan refugee to go to Siberia, on the basis that they are also Christian there. Excuse me, Jon, but you failed to address the problems caused by mass immigration which Jim raised. The UK is creaking at the seams. We Britons have had access to our services reduced and in some cases removed, all because of a rising population that YOU advocate. There are too many people living here, and if we aren’t educating our offspring to the required levels, then it proves that overwhelming numbers are reducing the efficiency of our education system. You can’t just keep importing large numbers of people, especially if many of them are of an alien non-Christian culture whose aim is to dominate the planet. Oh, they may not openly tell you that, but that is a fact. I know you hate Britain. It’s there in your desire for it to be ruled from abroad by the EU. It’s there in your desire to have its society and culture smashed. Thankfully, millions of Britons do not share your hatred, and we will be the ones preserving it for YOUR descendants, the ones who will look back on your folly and wonder what the heck you were thinking of. Why do you say I hate Britain? I love Britain; I am proud to be British. I do not support unlimited mass migration to Britain. I support migration to Britain that is good for the country. Maybe you have misread my articles? Only about 12% of the British population is foreign-born – and many of those are considered to be ‘British’ anyway, such as Boris Johnson and Joanna Lumley. 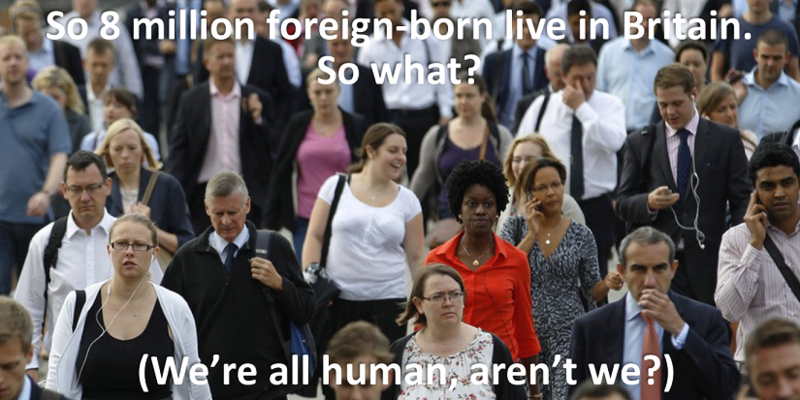 This is not a large percentage of foreign-born – it’s about the same in many other modern Western countries. Furthermore, as I have explained over and over again, migration to Britain is controlled. From within the EU, it’s controlled by the jobs market. EU migrants mostly come here for jobs, and if we had no jobs vacancies for them, there would be no reason for most of them to come here. We currently have a relatively large number of EU migrants right now because we have a large number of unfilled job vacancies – vacancies that simply cannot be filled only by the British workforce (unfortunately). If the British economy shrinks and we have fewer job vacancies, EU migration here will dramatically fall. That would be a bad thing for Britain, but it would be one way to reduce migration if that’s what you want. Migration from outside the EU is strictly controlled by an Australian-style points system. Regarding refugees, we are only taking a few compared to other countries – we could and should take more. In the past, refugees coming to this country, such as the Ugandan Asians back in the early 1970s, have helped to greatly boost the wealth of this country. Many refugees are highly educated and have skills that Britain needs. However, that shouldn’t be the only reason we help refugees now needing our help. Nigel Smith, you are welcome to your opinions, but please don’t misrepresent mine. In summary, I am British born and bred and proud to be so. I don’t believe in unlimited mass migration to Britain, or an entirely open-door policy. However, I do believe in free-movement of people across our continent (which works both ways) controlled mostly by the changeable needs of the jobs market. I welcome migrants coming here to work hard for our country. We’re lucky to have them; they contribute massively to our economy and government funds. We should say ‘Thank you’. Finally, I don’t believe we are ‘run by the EU.’ We are the EU. We help to run it. ” I do not support unlimited mass migration to Britain. ” But you support the EU’s open borders and the free movement of people within the EU. 400 million people have the right to relocate here, and there is nothing the UK can do about that. ” I support migration to Britain that is good for the country.” And how is that calculated or decided? We cannot deport foreign ‘wrong ‘uns’, thanks to our EU membership. ” Only about 12% of the British population is foreign-born.” It’s nine million people, many of whom will be having babies. We cannot cope with such numbers. “migration to Britain is controlled. From within the EU, it’s controlled by the jobs market. 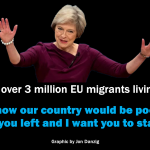 EU migrants mostly come here for jobs, and if we had no jobs vacancies for them, there would be no reason for most of them to come here.” And what about those do don’t find jobs, or who subsequently lose them? Do they go home, or do they stay? We cannot force them to leave. The fact remains that the UK jobs market cannot possibly control who comes here, and neither does the housing market. ” We currently have a relatively large number of EU migrants right now because we have a large number of unfilled job vacancies – vacancies that simply cannot be filled only by the British workforce (unfortunately).” And what about the unemployed EU immigrants? What about school-leavers? Are you suggesting that the offspring of EU immigrants aren’t capable of doing those jobs? we cannot keep importing people to the UK to fill vacancies; if a job is vacant, either increase interests in it by paying decent wages or leave it unfilled. The Miniumum Wage, btw, is the Maximum Wage for many situations, thanks to our open borders. A Bulgarian considers £6 an hour to be a small fortune. “Regarding refugees, we are only taking a few compared to other countries.” Why is that relevant to the argument? I don’t care how Germany and Spain are doing. I’m concerned about Britain, whereas you plainly aren’t. And the offspring of those refugees become EU citizens at birth, so they have the right to travel anywhere they choose. And we have a right to protect our heritage. You want to destroy it. You want vast numbers of Africans and Asians coming here, bringing their own cultures and in some ways imposing them. Have you been to Birmingham recently? It’s a foreign city. And please don’t give me any guff about ‘diversity’. Diversity means having your country changed for the worse. ” I welcome migrants coming here to work hard for our country. We’re lucky to have them; they contribute massively to our economy and government funds. ” So never mind the overcrowding, the extra pollution, the diminishing supply of clean water, etc….just as long as people pay, they can come here? That is madness. Is there a numerical limit, per annum, over the next decade that you would like to see introduced Jon? Roy Jacobs: the number of migrants here is primarily controlled by the number of job vacancies. Currently, Britain has more job vacancies than can be filled by the native workforce. That, in a nutshell, is why we need migrants. So, there is a limit already to the number of migrants coming here: the limit is the number of vacancies. We are not going to have millions more migrants coming here, for the simple fact that we don’t and won’t have millions of new job vacancies. See my related article, Why Britain needs migrants.